Sometimes I think I have really great ideas in the morning. I like to consider myself a morning person. I’m more productive during the morning. I get my best workouts in during the morning. But creative thinking? Maybe not so much. Because this morning, in my sleep-fog addled mind, I decided that it would be a good idea to defrost some salmon for dinner. Salmon which I had purchased from Trader Joe’s in a pack totaling over a full pound. I had no dinner plans tonight. No one was coming over. It would be just me and my 16 ounces of salmon. That’s a lot. of. salmon. 2. Place salmon filets on a rimmed baking sheet and gently slather coconut oil on top. 3. Sprinkle with spices and place in oven, baking for 5-7 minutes. 4. 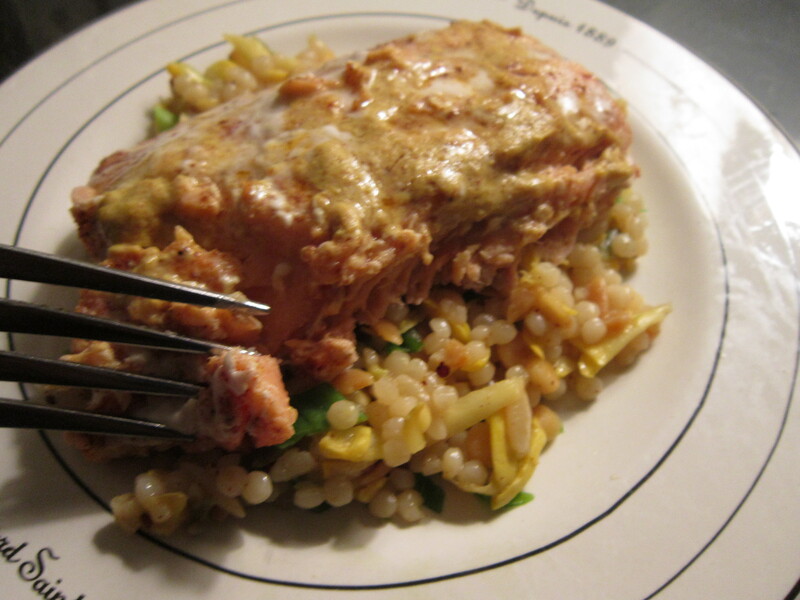 Remove from oven and slather mustard evenly over salmon. 5. Place back in oven and bake an additional 3-4 minutes, until fish flakes easily with a fork. Wish me luck. I have a lot of salmon to eat. 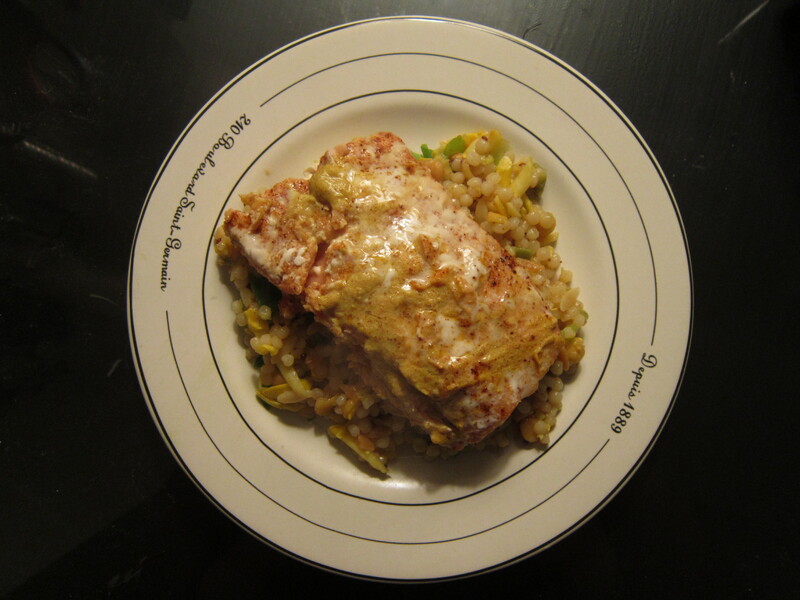 I am making Salmon Fish Cakes tonight – there’s an idea for ya, lol. That’s actually on my brain for the leftovers! That’s not a bad problem in my opinion 😉 I love how quickly salmon cooks! Bet it’s good with a little coconut flavor. hahaha I’m not a morning person at all. If anyone at work dares to talk to me before I’ve had time to get it together, I practically have fangs. I’ve had each of them with fish/salmon before, but I’ve never thought of coconut oil & mustard together! Totally intrigued. Mmm…those 16 ounces look ridiculously good. I agree with Katie – the coconut oil and mustard combo sounds awesome! Also, I have to agree that morning ideas = the best ideas. Can one really ever have too much salmon? I think not. It keeps for a while which means no cooking is necessary! It looks delicious my friend…love mustard on anything.